Corsair announced it has set a new DDR3 overclocking world record using a 1GB Dominator GT CMGTX6 memory module on a LN2 cooled PC with AMD's FX-8150 processor. The memory firm achieved a frequency of 3476.8MHz with 11-13-13-31 timings. The voltage is unknown, but further details can be read at Corsair. Up until last week I was using the Intel P55 platform to go after the frequency world record. However I noticed that the new AMD Bulldozer CPUs overclocked memory really well, so I went out and got an ASUS Crosshair V Formula and an AMD FX-8150 processor. 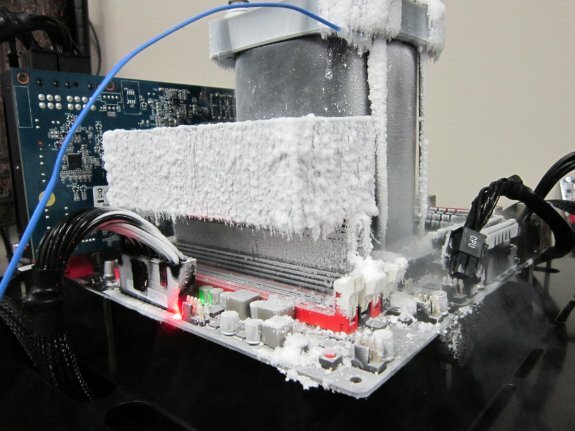 I cooled the processor and memory using liquid nitrogen. On the CPU I used a K|ngP|n Gemini CPU pot and a K|ngP|n Dominance memory pot on the CMGTX6 DIMM. You can read how I broke my previous personal best for memory frequency in a previous post..